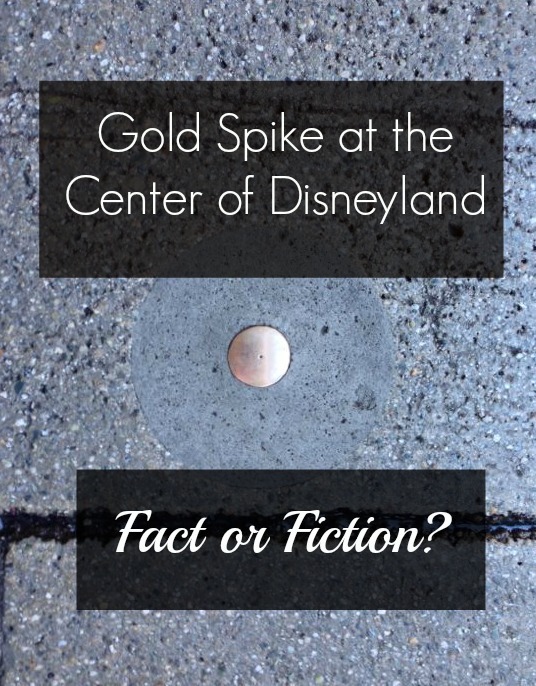 Disneyland Central Gold Spike: Fact or Fiction? Located just inside of the entrance tunnel to Disneyland’s Fantasyland is a gold spike. This central gold spike is believed to be the absolute center of Disneyland. I shared a photo of the golden spike on our Facebook page and all of you were very interested in what the Disneyland gold spike really is. 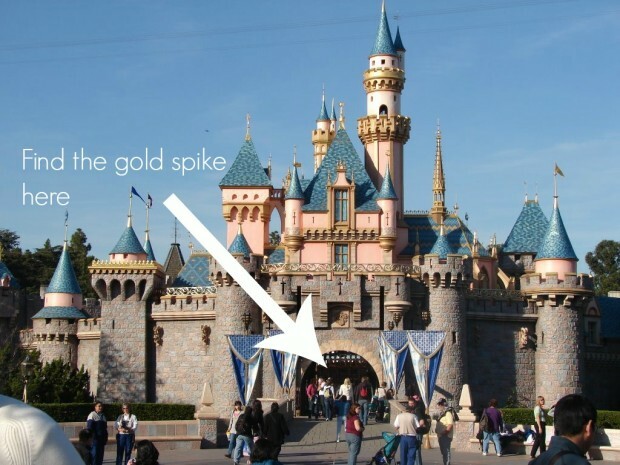 The central Disneyland gold spike has long been a myth that has circulated online in various forms. 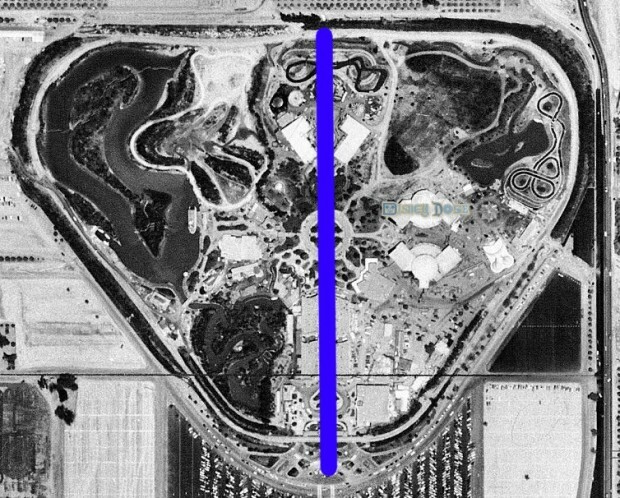 Some believe that the night before Disneyland opened, Walt Disney some friends went into the park and drove a spike into the ground at the center of the park and that it marks the absolute center of Disneyland. There is truth behind this rumor, but the overall statement that it is the exact center of the park is poppycock. The spike was planted in the ground on what was the central line of the park. Above I drew a line from the train station at the entrance of the park all the way to the back of the park, splitting the property exactly in two. This aerial shot is from 1955 from right around the time that the park opened. For detailed charts and information about the central gold spike, click here. Who caused the Disneyland golden spike rumor? For years now Disneyland fans, the Travel Channel, and the regularly factual Disneyland VIP Tour Guides have kept this rumor alive. 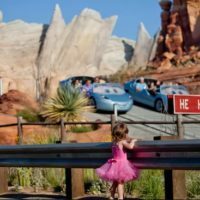 Most recently I heard a Disneyland PhotoPass photographer “educating” someone who had just posed for a photo about the amazing hidden gold spike. 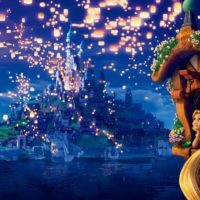 If you have enjoyed this article and want to keep finding out more about Disneyland, click here to join our Disneyland fan newsletter. 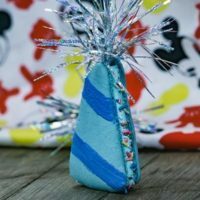 Please share this article through the buttons on the side of the article and by pinning the images above on Pinterest. This is not a spike, it’s a brass cap. It’s hollow underneath. It’s a survey monument. The little dot on top is to align survey equipment accurately. During the initial construction of the park, Monument 1 was located on the north curb of the hub, on the centerline of Main Street. Monument 1 no longer exists, and we don’t really need it anymore. In addition to Monument 1, there is a numbered network of survey monuments all over the park, which don’t all look the same. Some fans have mapped and photographed them, and posted them online. Meanwhile, in the 1950’s– due to the impending construction of the castle, it was not possible to see all of Fantasyland from Monument 1, so Monument 1a was established in what would become the castle’s breezeway. From Monument 1a, a surveyor laid out the locations of all the foundations in Fantasyland. Tony Baxter recently released time-lapse 1950’s construction footage from all over the park. If you watch the Fantasyland film, you can see the surveyor and his equipment located over Monument 1a. As for centeredness– This monument is located on the centerline of Main Street, but that’s pretty obvious. As you’ve noted, Main Street itself is not centered on anything. Yet this survey monument has remained mysterious to people because of its auspicious location, it’s “golden spike” look, and lack of markings; but it is no more significant than any of the other survey monuments in the Resort. Thank you for providing this fantastic update.